Linda has been motor boating all her life and 10 years ago ‘moved from the darker side’ into sailing! Linda's parents had a series of ever growing boats on the Thames, initially at Harleyford and then moored in Henley. The cruising was mainly inland but once a year they would venture tidal visiting Holland, Belgium and France for longer holidays. Ten years ago she and her husband decided to try sailing as both of their children were enjoying Dinghy Sailing with school. 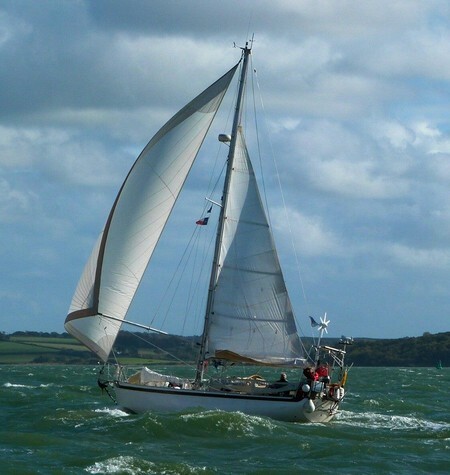 The trial weekend soon developed into flotilla holidays and RYA courses which have resulted in her achieving Yachtmaster Sail and Power. In August 2013 Linda was in St Katherine’s dock when the Clipper yachts entered to start the 2013/14 race. Having never heard of Clipper Round the World she met with staff and decided this was an adventure she could not miss. Linda signed up for the 2015/16 race to do 2 legs: leg 2 Rio to Cape Town and leg 5 Airlie Beach in Australia to Da Nang Vietnam and onto China. Her 18 year old daughter has also taken part in the 2015/16 race as a Gap Year completing legs 1, 2, 3, 5, 7 & 8. Linda will be sharing with us the story of her adventure from the training through to the race. Sue & Chris will talk about the delights, beauty and challenges of sailing amongst the labyrinth of islands in Maine, the inland seas of Nova Scotia, sorties to the wilderness outports of Newfoundland and overwintering in the snows. Sue Singer - mathematician, teacher, headmistress, educational consultant, executive head hunter – taught herself to sail her own dinghy aged 8 in the sea at the foot of her garden in Greece. Christopher Singer – computers, RAF navigator, seaplane pilot, aid in developing economies – was put off sailing when a teenager by just crewing in dinghies; but conversion started on the Broads soon after meeting Sue. After teaching their children to sail their Optimist and Mirror they shared a 29’ Tamarisk before buying in 1991 38’ gaff cutter Larry now 109 which has taken them round most of the North Atlantic, New York to Nova Scotia, Labrador, Greenland, Faroes, Arctic Norway, North Sea, Channel, most of the UK and Ireland and now in Galicia, Western Spain. 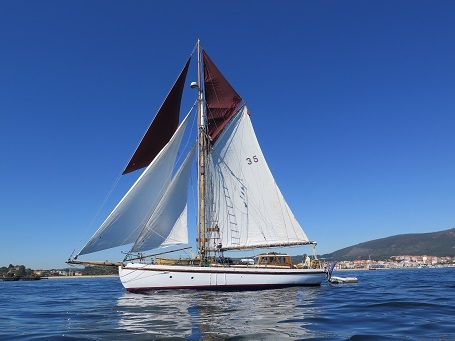 Throughout she has served as a platform for family holidays carrying three dinghies two for sailing, one for rescuing and rowing, all now well used by grandchildren on their own. 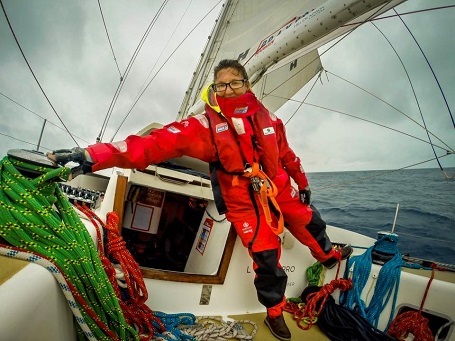 Mike will talk about rounding Cape Horn aboard Time and Tide with disabled crew members in the world's toughest yacht race. Mike was raised in Surfers Paradise, Australia before coming to England to complete his schooling. In 1960, he gained his parachute wings and served four years in the Special Forces TA, training to parachute at night behind enemy lines to carry out covert reconnaissance sending data back in encrypted Morse code. Mike gained a cadetship at the College of Air Training, in Hamble, and graduated as a Commercial Pilot in 1964. During his 33 year career with BEA and British Airways he flew the Vanguard, Trident, BAC 1-11 and variants of the B747, gaining his command in 1973. Mike's sailing career began in earnest when, in 1994, he competed in the Sydney-Hobart and the Sydney-Mooloolaba races while undergoing chemotherapy for Lymphoma. In 1996 he joined the crew of “Time and Tide” in the BT Global Challenge, sailing the Rio to Wellington, and Wellington to Sydney legs before acute Tenosynovitis of all his fingers and thumbs forced him to leave the boat in Sydney, and undergo intensive physiotherapy at the BA Medical Centre back in the UK. 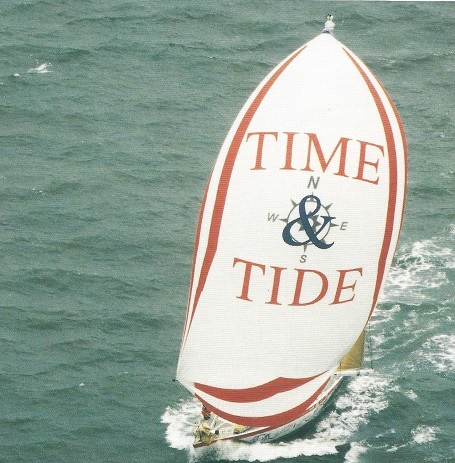 After retirement in 1997, he completed his first of three Transatlantic crossings to gain the Ocean endorsement of his Yachtmaster power and sail. He is a member of the RORC, the Royal Southern Yacht Club, the International Association of Cape Horners and the Army Sailing Association. Mike has sailed well over 55,000 miles and lives in Port Solent where he keeps his yacht “Up To Speed”, a Dehler 35, in which he intends to race offshore double-handed. This is a change to our previously advertised talk as the original speaker is not now available on this date. 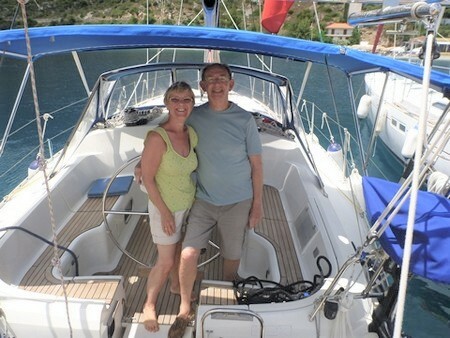 Members Trevor and Lesley Morey started sailing late in life. They sailed their Jeanneau 37.1 in the Aegean for 9 years mostly based in Turkey. Tonight Trevor will give an account of their 2013/14 trip from Bodrum, Turkey, North to mainland Greece, then South and West into the Evvia channel, en route visiting many of the Greek Islands and the Akti Peninsular. They also ventured to inland Thessaly to see The Meteora as well as negotiating the bridge at Khalkis. The season ended with a somewhat primitive haul out for the summer! Galicia - Its geography, coastline, climate, sailing conditions. - what can it offer to the cruising sailor. - places of interest, entertainment. Bill Tilman’s climbing and sailing achievements rank amongst the greatest in the fields of twentieth century mountaineering and deep sea cruising and his books remain essential reading for many who embark on similar ventures. By the time of his disappearance in the South Atlantic in 1977, he had left a legacy of some of the finest travel books ever written. The seven ‘Mountain / Travel’ books document the first stage of his travels, taking the reader from the coffee plantations and gold mines of Africa to the Himalaya and the highlights of Nanda Devi and Everest. The eight ‘Sailing / Mountain Exploration’ books cover the second stage, a series of high latitude voyages in traditional Bristol Channel pilot cutters. A highly decorated military leader, his covert operations behind enemy lines with Albanian partisans during the second World War are covered in ‘Where Men and Mountains Meet. Bob Comlay was one of only a handful of crew-members who chose to return for a second voyage with Tilman, earning a level of trust that gives him unique insight into the true character of this self-effacing legend of twentieth century exploration. 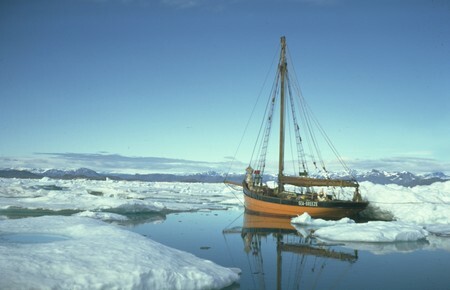 In 1997, Bob published a simple website containing images and anecdotes from the 1970 and 1971 voyages to West Greenland and East Greenland with later additions from a few other former Tilman crewmembers. While this hobby project remained incomplete, the level of interest that it drew from around the world over the past 12 years demonstrates the level of influence that Tilman and his travels still has on a wide variety of people. In recent years, the growth in interest has been significant, particularly amongst audiences of a new generation. John Mead’s 1981 TV documentary, ‘No Pay, No Prospects, not much Pleasure’ and Bob Comlay’s illustrated reminiscences, ‘Travels with Tilman’, have each been aired several times since Barmouth’s Tilman Festival’ weekend in May 2008. 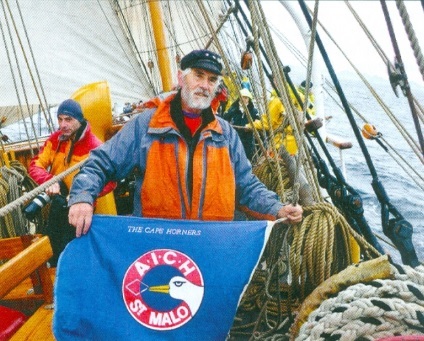 Waving the flag for Britain in the autumn of 1991 Chris joined the traditional square rigged sailing ship Søren Larsen with 33 others in the crew to take aim at Cape Horn. This talk illustrated with colour slides taken on that voyage tells the story of how this little 150 ton brigantine sailed the great expanse of the Southern Ocean, where some way into the 7000 mile expanse of seemingly endless sea you are as a sailor the furthest it is possible to be from land on the planet. He tells how they celebrated the loneliness, the lime juice ceremony, paying off the dead horse 30 days out, arrival off Cape Horn in a force 6 and then destination Falkland Islands. Singers sing about this place, Chris was there and square rigged at that, in the first British owned and registered square rigger to make the Horn in 55 years. Then blow me again in 2015 he went again this time in Europa he may tell of that or of crossing the line should there be time in a 60 minute show. Chris Roche is a now 70 year old who in his youth met the late great Stan Hugill the then last living Shantyman who shaped him into the man he became. Chris was born at Folkestone where he first saw tall ships from the hills above the town when he saw what was the square sails of the first tall ships race that would have been 1956 and perhaps even Sørlandet a ship he later sailed the Atlantic in was one of them. Chris went to sea to find out how the songs might have worked when heaving and hauling on lines and capstan bars. In real life he was a plumber another affinity with water. He is also the editor of the Journal of the IACH 'the Cape Horners' a volunteer post he has held for thirty six years.